Skin Repair Serum contains Argan Oil, produced by a women's cooperative in Morrocco and sold on a fair-trade basis. Argan Oil is very rich in vitamin E, antioxidants and radical scavengers; it's also known for its anti-ageing, regeneration and moisturising powers. Reed and Baobab extracts- Help to protect and tighten the skin. Safflower, Omega-fatty Acids- To help maintain the skin’s lipid balance and smoothness. This repair serum is vegan-friendly and contains no synthetic preservatives, fragrances or colourants. 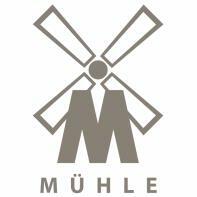 Muhle organic skin repair serum, ideal for use on face and under the eyes. This is a BDIH certified organic skincare product. Only products that meet the strict standards of the guidelines are able to display the BDIH 'Certified Natural Cosmetics' seal. 30ml pump action, recyclable bottle. Massage a small amount of serum onto your face and around the eyes to repair and revitalise tired, jaded skin. This certified, vegan, organic, repair serum is essential for revitalising and reinvigorating facial skin and the areas around and under the eyes. *Ingredients from biologically regulated cultivation, **natural essential oils.